Custom mining wear solutions, engineered for your requirements. We can provide tailored, custom mining wear solutions to any abrasive wear issue using combinations of custom and standard Abreco wear liner products. Beginning with an onsite consultation, we can design, test, manufacture and oversee the installation of the perfect wear system for your individual needs. Ask us about our Wear Point Survey to allow the proper evaluation of high priority items and a comprehensive plan to enable execution. 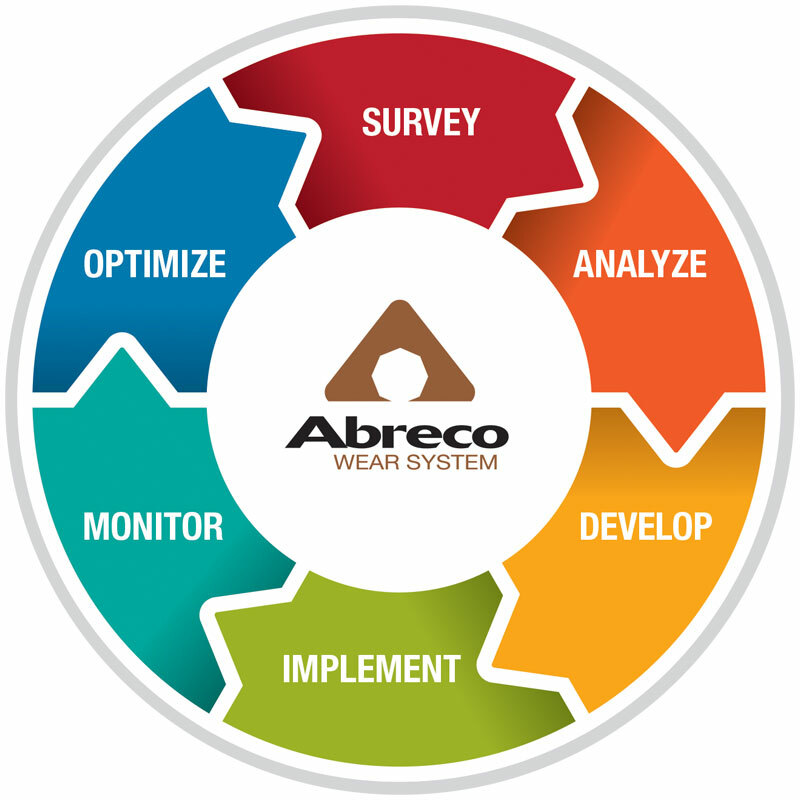 The Abreco Wear System is an engineered wear solution and was developed using material knowledge and application experience to create the most comprehensive fixed plant protection package in the industry. optimizeOnce the system is installed and we evaluate the performance, we can then optimize the design to achieve higher expectations for you. Optimizing the system for maximum efficiency translates into millions of dollars of productivity with minimum intervention and down-time. surveyStarting with a Wear Point Survey and/or information exchange, we will evaluate and document your equipment and application in it's current state. This phase tells us where the issues are and what we can do to solve them in the most efficient and cost-effective way possible for you. analyzeUsing the information gathering in the Survey stage, we will review based on your priorities and goals. When possible, we use customer provided KPIs as the basis for decision making in the proposed solution. We are always using your objectives and needs as the focus of our processes. developUsing our hands-on experience, our design team will create a customized solution for your needs. By using proven Abreco components, we can adjust details and configuration for each end user while providing a quick turnaround and ensuring product with maximum service life. implementThe Abreco installation can be overseen or managed by our own internal application specialists. CWT also works with local contractors to support the proper installation of the product. This phase is effectively the hand-off from manufactured concept to installation in the field. monitorWe provide you with a suggested ongoing monitoring schedule and a forecasted life. Given the consistent life of the material, we create an estimated re-purchase point. At this point, liner tracking is achieved, high wearing areas are identified and the system is evaluated for optimization.